There are so many wonderful ways you can use the copyright free images shared on Reusable Art. From time to time we will be adding ideas, tips, and tutorials on how to use these free images for crafts, websites, and other projects where vintage images are used. Keep in mind that these images are photographs, drawings, and sketches that may not be readily resized without a major loss of quality. Most images in the collection can be made smaller without losing quality but making the images larger may not always work without some killer skills. I have tried to limit the amount of editing that I have done to the images here on Reusable Art. The earlier images were not edited at all, other than some cropping. Later images have some editing done to them but the goal was to preserve the quality of the images and allow our site visitors to have the fun of really making these images their own. Many of the copyright free images are the perfect size to make notecards and with a coordinating colored frame or paper background would make charming and professional looking items. My goal with Reusable Art has always been to provide as many vintage images as possible. Therefore, I don’t take the time to come up with all that many crafty ideas for using the images. What I do have here to share with you is a pair of simple Photoshop tutorials on how to colorize black and white images. This section of Reusable Art has been somewhat neglected since I started this site. It’s my hope that in the future, there will be more tutorials and projects here for you to enjoy. If you work with vintage images and create art with them and are willing to share some of your expertise, I would love to hear from you. 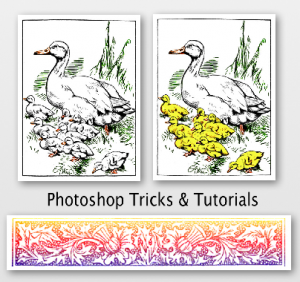 I am nowhere near being any sort of expert with Photoshop but I did figure out a few little tricks that might help you when working with vintage images. The menu names and options refer to Photoshop from the CS2 Creative Suite but hopefully they are simple enough features that they will work the same way in later versions.